Jollibee Online Delivery via Jollibee Delivery Online Website JollibeeDelivery.com had extended its Promo for Free Limited Edition Coca-Cola Tumblers upon online purchase at JollibeeDelivery.com Just got my Limited Edition Coca-Cola Tumbler and I can say that it's Cool! 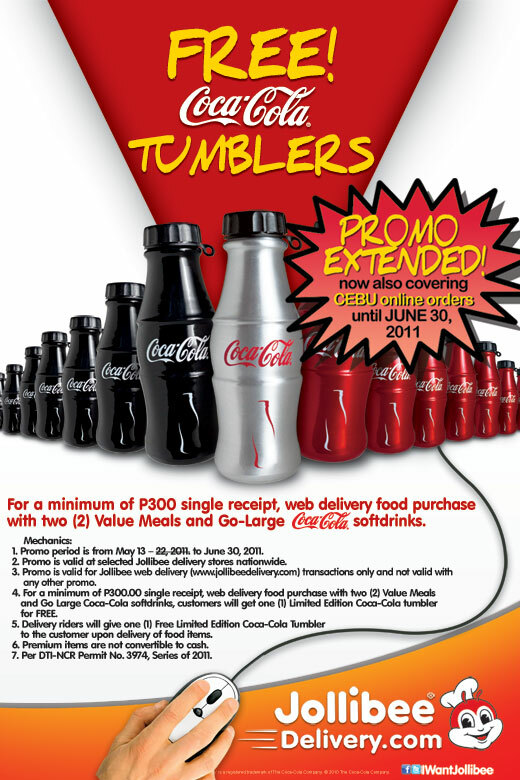 Just follow the Jollibee Online Delivery Free Limited Coca-Cola Tumblers Promo Mechanics below. Enjoy your Jollibee Value Meal, Your Ice-cooled Coca-Cola Drink and Your new Cool Limited Coca-Cola Tumbler! For a minimum of P300.00 single receipt, web delivery food purchase with two (2) Value Meals and Go-Large Coca-Cola soft drinks. 1. Promo period is extended until August 31, 2011. 2. Promo is valid at Jollibee Online Delivery Only - CEBU Area. 3. Promo is valid for Jollibee delivery transactions only and not valid with any other promo. 4. For a minimum of P300.00 single receipt, web delivery food purchase with two (2) Value Meals and Go-Large Coca-Cola soft drinks, customers will get one (1) limited Edition Coca-Cola tumbler for FREE. 5. Delivery riders will give one (1) free Limited Edition Coca-Cola Tumber to the customer upon delivery of food items. 6. Premium items are not convertible to cash. 7. Per DTI-NCR Permit No.3974, Series of 2011. How to Place your Jollibee Online Order? Just go to www.JollibeeDelivery.com and create an account, everything should be as easy as browsing Facebook, the website will also guide you through a online purchase style procedure. Basic requirement is your email account. 0 comments: on "Jollibee Online Delivery Website Promo Limited Edition Coca-Cola Tumblers"